One of the deep-sea fishing vessels that comes to Tristan is the MFV Edinburgh. This trusty boat was built in 1970, and was named Hekla. People who are familiar with the island of Iceland will know that Hekla is also the name of one of the most significant live volcanoes on that island. Hekla was bought by Ovenstones, sometime in the 1980’s. 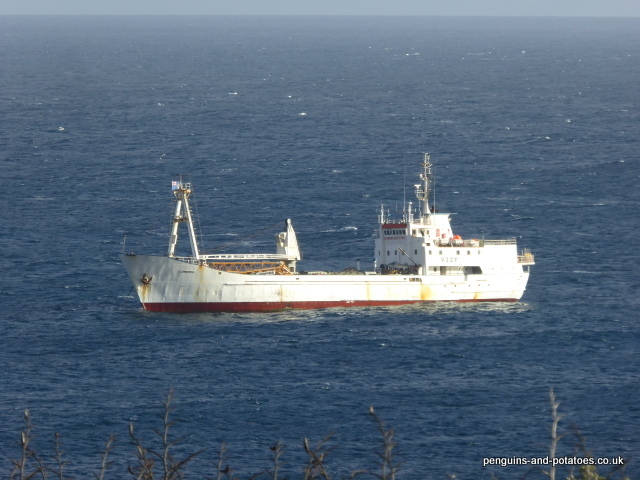 Ovenstone Agencies is the South African company that currently has the fishing concession on Tristan da Cunha. At that time the ship had a name-change, and she became MFV Edinburgh. Presumably this was in recognition of the formal name of the settlement on Tristan, which is Edinburgh of the Seven Seas. Edinburgh is one of two ships operated by Ovenstones, the other one being the MFV Geo Searcher. In any one year, the Edinburgh is scheduled to make six visits to Tristan, and the Geo Searcher to make three visits. Each visit from Cape Town may have a number of different objectives, which can include fishing for lobsters among the off-lying islands, delivering cargo to the island, delivering fuel to the island, long-line fishing for pelagic fish on the Tristan sea-mounts, taking lobster back from the Tristan factory to Cape Town, and of course taking passengers of all sorts from Cape Town to Tristan and back again. 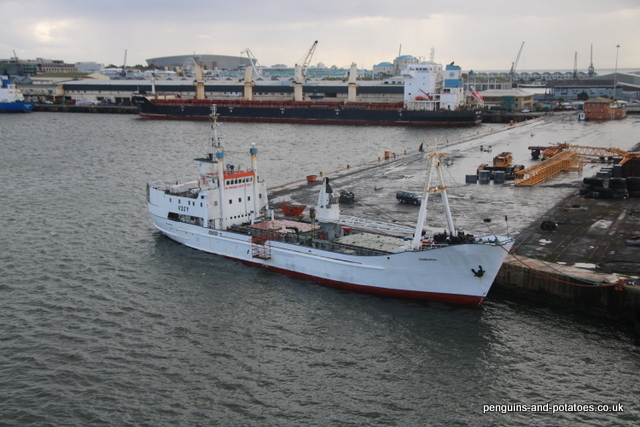 Apart from the once-a-year visit of the ship called SA Agulhas 2, virtually all passengers arriving at Tristan or leaving the island will be carried on these deep-sea fishing ships, each carrying up to 12 passengers. The visits of these ships are not scheduled to take place regularly throughout the year – there can be long periods with no ship, then two arrive virtually together. This does not affect the fishing operations, but it does have an effect on all the departments on the island who are dependent on these ships for their supplies, not least of which is the ‘Supermarket’. The Edinburgh departed from Cape Town for her most recent visit on the 16th of January, with an expected arrival date of the 23rd of January. This ship was eagerly awaited, particularly for her delivery of fresh fruit and vegetables because the previous shipment was on the 19th of November last year. However, on Tristan not everything works to plan. The ship was more than half way across when she encountered engine problems, and had to turn back to Cape Town for repairs. She departed Cape Town for the second time on January 25th, and finally arrived on the 31st of January, eight days later than expected. Weather conditions were good enough to get the passengers off that evening, but it was not until the following Monday, the 4th February, before it was possible to start unloading some of the fresh cargo. Hence, it was some 10 weeks from the last delivery in November to the present one. The fresh produce was eagerly awaited. 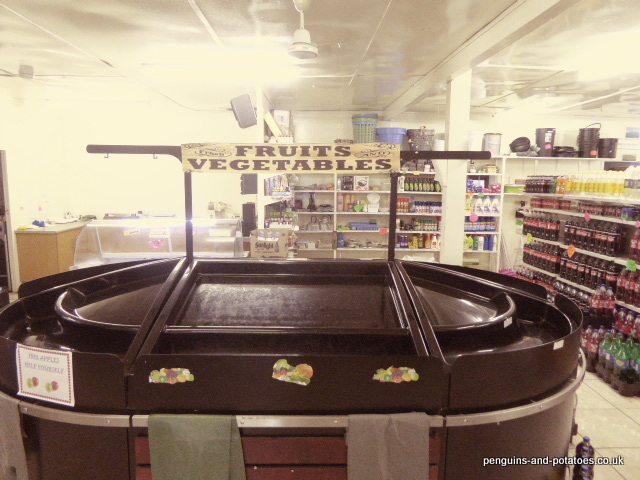 The fruit and vegetable shelves were empty, and islanders were looking forward to stocking up with some healthy food. Unfortunately, the story does not stop there. When the first pallet of fresh goods arrived outside the shop, it was found that there was some mouse damage. In particular, a mouse had eaten its way through some of the sweetcorn, and evidently the cold conditions of the chiller on the boat eventually became too much for the stowaway, because the carcase of the offending rodent was there to be found. This caused the entire fresh consignment to be condemned. Five trailer-loads of fresh fruit and vegetables were taken up to the dump at Pig Bite, where they were buried. There was a similar event with a shipment just before Christmas in 2016. On that occasion some frozen pig products had been loaded in Cape Town on top of a pallet of fresh fruit, which had then been placed in the chiller unit on board the ship. The unloading of the ship was delayed by bad weather, the pork thawed and seeped all over the fruit, and the consignment was condemned. Wearing my hat as agriculturalist, it does seem to me that these two incidents send a very clear message. This simple message is that it is so important for the island to take seriously the concept of becoming self-sufficient in all possible crops, in order to reduce to the minimum the reliance on imported fresh products. It is a shame that the islanders have to go without fresh fruit and vegetables while the slow evolution of change takes place.